Watch travel videos, interactive 360 degree virtual tours, get driving maps, visit websites and print value savings coupons and tourism brochures. 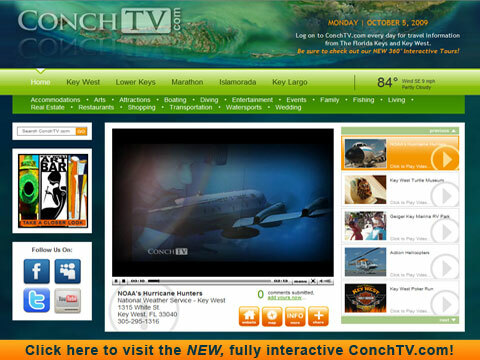 ConchTV.com makes Florida Keys and Key West vacation planning exciting and easy! Our very own expert travel hosts take you behind the scenes for first look video access into "The Conch Republic" lifestyle and the people who define it. Don't forget to log in every day and stay up-to-date on our most recent tourism video segments and the Florida Keys and Key West news. The Conch Republic Group, is a marketing network of broadband video websites committed to promoting travel and quality businesses in The Florida Keys and Key West. In informative, entertaining video episodes, The Conch Republic Group brings you the newest and most exclusive tourist destinations that The Florida Keys and Key West have to offer, always free and on demand. The Conch Republic Group and ConchTV.com cover the Florida Keys and Key West topics such as accommodations, arts, attractions, boating, bridal, dining, diving, bars, entertainment, events, family, fishing, living, news, realtors, shopping, tourism, weather and watersports. All Florida Keys and Key West travel programming is thoroughly scouted to ensure that The Conch Republic Group and ConchTV.com brings you only the finest travel destinations, products, services and tourist trends.